Authentication is the third in a series of posts covering the key concepts of RIA Services using the Book Club application to digger deeper and go beyond the basics. Links to the first two posts on validation and authorization as well as an overview of the application/source code are at the end of this post. "Do these credentials represent a valid user?" Credentials might be user name and password, or any other piece of data that can be used to verify that the user is who he/she says they are. Generally, a side-effect of authentication is to produce a representation of the user, usually represented as an IPrincipal, as well as establishing an authenticated session for the client to use in making subsequent requests. RIA Service defines an authentication service as a domain service that implements IAuthetication<TUser> where TUser is application's notion of a user that brings together identity, roles and settings that span across client and server. RIA Services also provides an out-of-box implementation based on the standard asp.net membership, roles and profile infrastructure services. If you use the business application template, this is all setup for you by default. However RIA Services also lets you implement your own authentication service when you want to use your own custom credential store, or a different authentication mechanism such as OpenID. This post covers using authentication and the User object on client and server, as well as building a custom forms authentication service that works against the application's data model. I created an inplace-LoginControl with a number of visual states (Unauthenticated, CredentialInput, Authenticating and Authenticated) as shown here. The FormsAuthentication implementation uses a DomainContext to work against the corresponding DomainService implementing IAuthentication on the server. We'll see this service implementation below. The resulting User object can be used imperatively as shown in the code above, or declaratively via data-bindings. return ObjectContext.Books.Where(b => b.MemberID == _user.MemberID). The domain service has been marked with the authorization rule stating the service requires authentication. Consequently, RIA Services will ensure that there is a valid IPrincipal whenever this service is invoked. However, the service also requires a User object to be passed in into constructor, so it can use it when retrieving shared by the current user, or when initializing an AuthorizationContext to pass along the User in into authorization rules. In order to pass in custom values through the constructor, one needs to implement a custom DomainServiceFactory. The default one only works for domain services with default parameterless constructors. In the application, I have implemented a simple domain service factory, that uses hardcoded logic, but in a larger application, the general idea is to use an IoC container and call into that from the custom DomainServiceFactory. Notice the use of the helper class, Authentication, that allows you to correctly instantiate the authentication service on the server, invoke it and retrieve the User object corresponding to the current authenticated principal. This helper class is in the RIAEssentials framework (link below). The resulting User object is passed in when constructing BookShelfService. As you see, one of the tables is the Member table. It is intrinsically tied to various other tables by virtue of multiple associations. It also contains information about the user, such as display name, last login date, joined date etc. As such, I'd like my authentication implementation to use this Member table from my data model directly. One of the key things to think about in your application is what constitutes the User object than spans across client and server. What is the state you want to expose to the client for visualization purposes, and what is the state you want to have quick access to within the context of an authenticated session? These are the questions to ask. I added DisplayName, so it can be used on the client in the UI. I also added the MemberID, so this information can be used on the server on subsequent requests (for example, when doing authorization to ensure a user can only update a book they own - see the authorization post for that example). 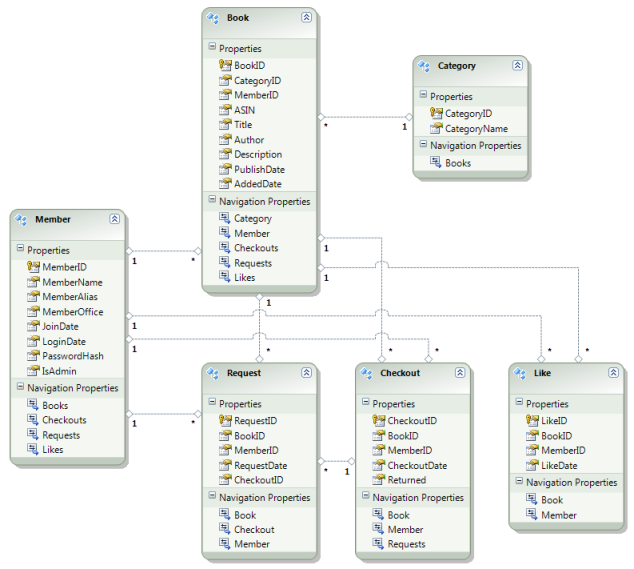 The User object will be populated from the Member entity from the data model. 1. Derive from the out-of-box AuthenticationService base class. 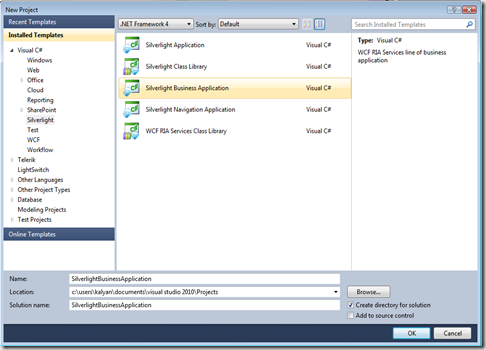 This provides a default implementation that leverages the asp.net membership, roles and profile infrastructure. 2. 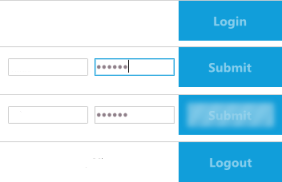 Implement IAuthentication on your domain service and do whatever you like based on your unique scenarios when implementing Login, Logout and other methods of the interface. This is especially useful if you're not using the asp.net infrastructure services or want to use some custom auth mechanism. In my case, I want to use my own DAL and its notion of members, so I am going to build my own custom authentication service. However, I don't really want to implement the intricacies of forms authentication, which aren't specific to my application, such as setting up HTTP cookies. I only want to write the parts that interact with my data model (very much in spirit with the rest of RIA Services - focus on your application logic, and not the on-wire or service plumbing). bookClubObjectContext.Members.Where(m => m.MemberAlias == name). Also note how the validation method tracks the last login date, which is something that is captured within the data model. In the initial version of the Book Club app, the code was [incorrectly] storing passwords in the database. In reality it was a detail that I had yet to get to. Since I am now writing about authentication, I have fixed this. The database stores password hashes, rather than passwords in clear text. This required a small schema update, so you'll need to recreate the database and run the BookClub.sql SQL script before you run the code. Any application code that uses the authentication service only depends on the contract defined by IAuthentication (whether it is the server, or the client), giving you freedom to implement what it means to authenticate and produce a User object as you desire. If you use forms authentication or even basic authentication (i.e. anything that transfers a user name/password as clear text from client to server), you would be advised to use HTTPS. This takes a little bit of setup, i.e. setting up an HTTPS site binding, that goes beyond the scope of this post. However RIA Services makes it easy to declaratively indicate that a particular domain service should only be exposed to the world using a secure endpoint, once you've handled the server configuration. At times you need to show some AutoComplete dropdown below a textbox as you starts typing. So that you can select any suggested text from the below list. Ajax Control toolkit will do this job quite easily but for those who doesn't want to use Ajax Control toolkit, JQuery is like another option by which they can replicate everything available in Ajax Control toolkit quite easily. Here we will see how we can make our own AutoComplete using JQuery and WCF. Add a textbox and a script manager with reference to service. Add this JQuery in head tag of your page. and finally create a WCF service. We will create 2 example with WCF service. First of all we will create a WCF service and configure it to response as json format. We will bind endpoint with webHttpBinding. We will create service with name “AutoComplete” and our interface will be IAutoComplete. We will create an endpoint behavior which uses webHttp behavior. So our web.config file will have configuration as below. Now we will add reference of System.ServiceModel.Web to our application, because we will be using some of its features. In our first example of jQuery autocomplete, we will create a WCF service method which will return simple string array. In our interface we will create method GetTagString which will return us string array. In above declaration you will be able to find that apart from OperationContract there are some more attributes are assigned to method. WebInvoke attribute is part of System.ServiceModel.Web. WebInvoke adds meta data to the service method, provide operation behavior and verb on which method will be invoked. Method parameter will define which method will be used for invocation, we will use GET. UriTemplate will define url template in the service and bind url parameter to method parameter. We will use RequestFormat and ResponseFormat as WebMessageFormat.Json. We will implement the interface and write below method into AutoComplete.svc file. Currently I have used static array of tags and then filtered it with LINQ to response only those items which are starting with the term our autocomplete have provided. Now on the aspx page, we will create a html input and then add a script to add auto complete to it. So it will give us output as below. This output and method of autocomplete is not much different from the original jQuery example. The only difference is we have created autocomplete with a WCF service. In above example we have created autocomplete with only names. In real life scenario we have different requirements as well. One of the scenario is when we retrieve a tag name we need its id as well. So how we will achieve it with modification in our above example. To achieve it we need to first change original jquery.ui.autocomplete.js file. We will add our function into this file so that our example works perfect. We have put a check that if normalize function defined by us is not null then we will call it otherwise we will call default _normalize function. You must have question that what does this normalize function will do. Normalize function will parse our service response and pass it to autocomplete so that it can generate the output. We will create a class named Tags which will have property of tag name and id. We have applied DataContract attribute to our class so that it can be transferred with out WCF service. In above example I have added items manually to list and then filtered it with LINQ to return desired output. In above script we have specified two functions in the options. One is normalize and another is select. I will first explain normalize (which I have created with reference from jQuery’s original _normalize function) it will have items as input. When jQuery request to our service it will parse the response as json and pass it to normalize function. In first if block we have checked that whether json output contains label and value as attribute then we will return same items as output to process further. We will note here that if we always want to use label and value as class member then we do not need to modify autocomplete.js file. Now after the if block we have mapped our data with assigning tagName and id to label and value respectively. So autocomplete can parse our item and display us the autocomplete menu. In select function we will specify that when user select an item how should it be processed with the data. In our case we have assigned tagName to our textbox value and id to our label text. With this logic you can create your own autocomplete and even you can convert your dropdowns into a nice autocomplete. This post specifically discusses the authentication mechanisms forms and windows. 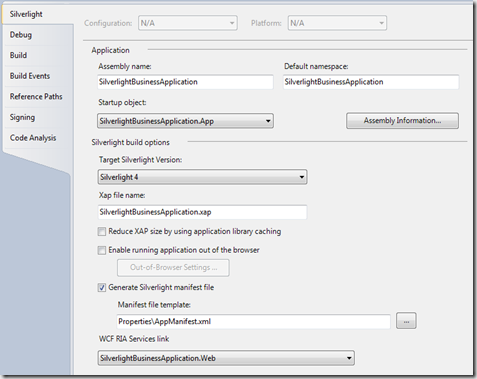 By Default Silverlight Business Application allows the users to register and login with built in controls. This template also gives you navigation ability where you can easily add Silverlight pages for additional functionality. 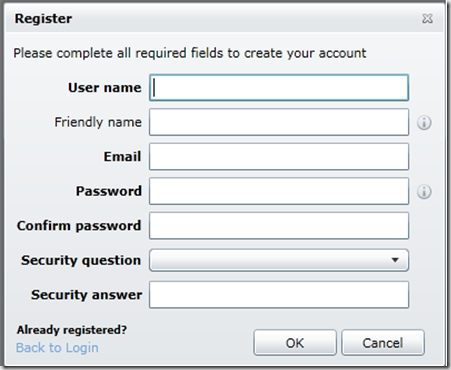 It also enables authentication, roles and profiles. 2. 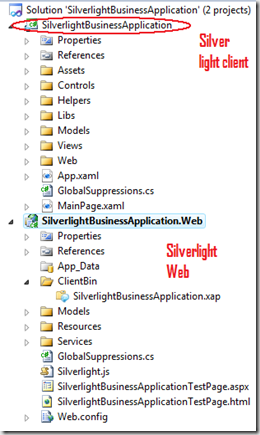 Right click the Silverlight client project and select properties. Notice at the bottom of the project properties of the dialogue box RIA Services link exists between the client and server projects. 2: /// Creates a new <see cref="App"/> instance. 9: // This will then be available as WebContext.Current. Build and run the application, now you will notice login details with windows authentication.